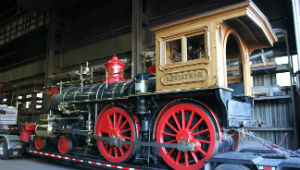 The Lincoln Funeral Train has attracted thousands of visitors each day that it has been on display at other host sites. In addition to hosting school groups and special events, the South Shore CVA will offer visitors the opportunity to purchase tours of the funeral train car. "This is a great opportunity, especially for young people, to see and experience what it was like to pay their respects to Abraham Lincoln," said David Kloke, master mechanic for The 2015 Lincoln Funeral Train. Special events include a book signing and lecture by Susan Gilbreath Lane beginning at 1 p.m. on Saturday, Oct. 10. Gilbreath Lane edited and published journals of her great grandfather, who was a major from Valparaiso in the 20th Indiana Infantry, which details local men&apos;s service during the Civil War. The South Shore Civil War Memorial Trail is a collection of the last known resting places, monuments, architectural icons and sites with Civil War ties that are related to the brave men and women from the region who sacrificed during the most pivotal period in our nation&apos;s history. The trail serves as a guide for visitors who wish to pay their respects to the veterans and learn the stories of their humanity and sacrifice during and after the war. Lincoln funeral train visitors will have the opportunity to learn more about the South Shore Civil War Memorial Trail during a special exhibit inside the W.F. Wellman Exhibit Hall at the Indiana Welcome Center. The Indiana Welcome Center is located at 7770 Corinne Drive in Hammond, Indiana. For more information on tours, special events and field trip opportunities, contact Bethany Randolph at 219-554-2229 or bethany@southshorecva.com. To learn about sponsorship opportunities, contact Katie Holderby at 219-989-7770 or katie@southshorecva.com. For more information on the Lincoln Funeral Train, visit www.southshorecva.com/lincolntrain. The 2015 Lincoln Funeral Train arrived in Northwest Indiana on Tuesday, Oct. 22, and is being stored at ArcelorMittal Burns Harbor. The train will be on display at the Indiana Welcome Center Thursday, Oct. 8 through Sunday, Oct. 11.